Marketing for First Man touts Damien Chazelle’s latest as the story of humankind’s first trip to the moon. The fateful day way back in 1969 when the dreams of John F. Kennedy came to fruition and we put a couple of meat bags on that giant ball of cheese in the sky! Before the film started, I pictured men in short sleeved button-up shirts with thin black ties and thick framed glasses, yelling into headsets, gesturing wildly, and ultimately cheering as their giant wall monitor confirms what we in the audience already know: Man has landed on the moon! Handshakes are exchanged, smoke breaks follow, and as the oldest of the bunch wipes sweat from his brow he jokingly says to his cohort, “Next time, I’M driving!” They all laugh as the America-flavored orchestral score resonates through the theater, giving moviegoers a feeling of pride. We here in the U-S-of-A can do anything we put our minds to just so long as we give it our all. Sure, we’re a bunch of sexist, racist cowboys with a taste for vengeance, violence and superiority, but toss some math and rocket fuel our way and there’s nothing we can’t do. Ticker-tape parade! Balloons! Floats! Ladies with batons! Fellas in uniform! Fireworks! But it’s not that movie. And frankly, I’m pretty happy about it. My belief that Americans can do anything we put our minds to was put to bed long, long ago, and with things the way they currently are, the “Rah! Rah! America!” flavor probably won’t go down easy with the cultural masses. Instead, Chazelle’s follow-up to the one-two punch of awards favorites, Whiplash and La La Land, takes a more character based approach than other films of its ilk. Josh Singer’s screenplay, based on James R. Hansen’s book The Life of Neil A. Armstrong, takes the world changing stakes of America’s greatest technological feat outside of the fidget spinner and focuses them all on the characterization of one man. Think about it. We all know what Neil Armstrong did, and we all know his name spelled backwards is “Gnorts, Mr. Alien,” but do any of us really know anything about him as a person? I most certainly did not, and First Man does a fair job of correcting that by giving us as big a window as possible into the life and struggles of a man who led what was essentially a suicide mission, and helped to make it a success. The thing is, First Man makes it very clear that Armstrong was a pretty closed off guy, so it's up to you how cinematic the act of brooding can be. For me, it was a mixed bag, leaning toward success. Ryan Gosling embodies Armstrong with an intensity that speaks to the actor’s versatility, but doesn’t always make for the most accessible viewing. To correct this, he’s surrounded by a bevy of colorful characters, all played by faces you recognize (and some with names you recognize too!). It’s his colleagues’ reactions to Armstrong which ultimately tell the most story. Be it Corey Stoll’s Buzz Aldrin matching Armstrong’s stoicism with loud mouthed incredulity, or Claire Foy’s Janet Armstrong demanding that the men of NASA consider that she stands to lose more than anyone if the mission goes wrong, First Man shows us a world which revolves around Neil, even as he tries to leave it. It’s hard to fault Armstrong’s characterization while the movie is unfolding, since the pacing is pretty rapid fire, for better or for worse. On the one hand, there’s nary a dull moment, on the other, we are not given much time for individual scenes of drama to set in. For those who are unfamiliar with the day to day timeline of the Apollo missions, it becomes difficult to track how much time has passed between scenes, forcing the audience to rely on fashion, hairstyles, and the changing age of younger characters to keep up until the next title card. It’s a small issue, but when big dramatic scenes end, seemingly with an eye to propel the next one, we often find that months have passed and things have moved on. Moment to moment it works (Chazelle’s ability to create tension out of a static two shot is downright masterful), but taken as a whole it makes a lot of the film’s meat feel like an extended montage. 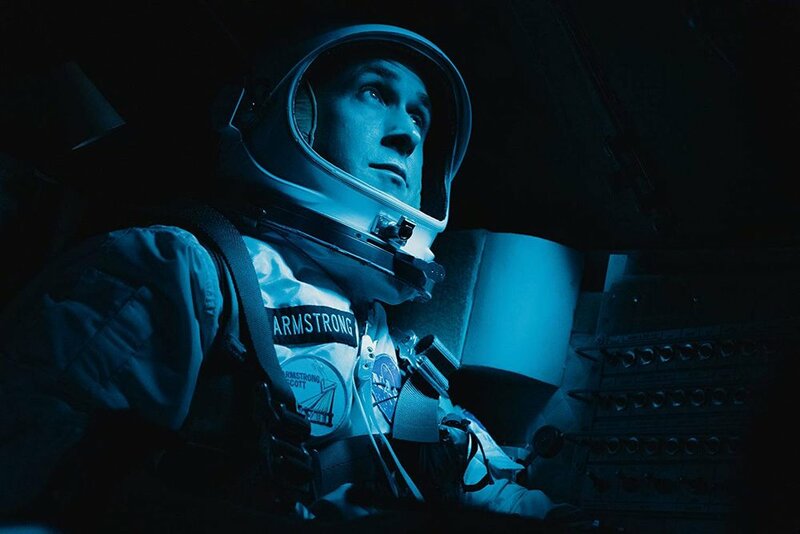 When faced between leaving out a detail or two for the sake of flow and cramming in everything that happened in the decade leading up to the moon launch, First Man finds the most reasonable middle ground, and walks it flawlessly. Whether or not that makes for explosive viewing is up to you, but for me, it feels a bit like a missed opportunity. If Chazelle wanted a moon landing procedural, all of the pieces are there. Same too if he wanted a Neil Armstrong biopic. But to have it both ways dilutes things a bit, which makes for a relatively flair-free watch. No, First Man isn’t bland, but it rides a steady, respectable line drive from beginning to end, even though it had all of the material to shoot for a home run. It sounds like I didn’t like this movie. I did. I liked it quite a bit actually. I’d even say that it’s very, very good, but after his previous two films, each of which sufficiently blew me away, I was hoping that Chazelle would really make his space movie pop. Instead, it just cruises along, letting the technical proficiency on display act as the primary propulsive narrative force. So much of what goes on at NASA may as well be actual footage, because Chazelle has nailed every detail down to the most minute. Even the cinematography, by Linus Sandgren (La La Land, American Hustle) captures the documentary feel of the scenes at NASA and in space. There’s a gray-blue hue over everything that sets a somber mood which can be tipped into either melancholy or elation with a well-placed music cue (Justin Hurwitz, KILLIN IT) or subtle performance note — oftentimes, this duality will occur in a single scene. By the time we (spoiler?) get to the moon and we see what the vast emptiness of space looks like when depicted for factual reality rather than sci-fi showoffery, Chazelle’s vision coalesces, and the juxtaposition of man’s one small step to humankind’s large one retroactively heaves itself upon the previous two hours. Any doubt I had as to the tone of First Man was cast into the solar winds, and I found myself exactly where the filmmakers wanted me to be. As I swallowed back a potential sob, the enormity of man’s first trip to the moon suddenly revealed itself. Humankind did the impossible. If, as the film posits, Armstrong’s desire to travel beyond our atmosphere was one of gaining new perspective, then this technical marvel can certainly be considered a success. All too often we forget how relatively small our planet is, and how much smaller are the tensions which broil within it. BTW, why was I not consulted when Patrick Fugit was permitted to stop being a teenager? Dude is pushing forty and I’m pretty freaked out about it.